Cosmetic dentistry used to be a celebrity-driven practice. Stars needed brilliant white teeth to look perfect for every photo op, but regular folks weren’t so keyed into the shade of their smile. In 2018, cosmetic dentistry has exploded as an industry. More and more people are arranging procedures to whiten, straighten, and cap their teeth so their smile can be uniform and ultra-healthy looking. Most people cite wanting to increase their attractiveness as the main reason for seeking out cosmetic dentistry procedures. A dull smile can age you and reflect negative hygiene habits. For those who are wary of cosmetic dentistry, it’s helpful to know the myths and facts surrounding it. As with anything that experiences a popularity surge there will be a lot of misconceptions and misleading stories circulating, so it’s important to set the record straight. Take a look at some of these common misconceptions about cosmetic dentistry. Dentistry has come a long way since the times of menacing power drills and aching jaws. 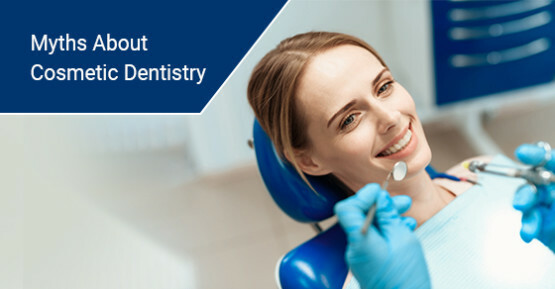 Dentists today take great care to make sure there is no pain during a procedure, using a variety of sedation techniques to render patients oblivious to pain. You might not even remember the procedure by its end. Cosmetic treatments tend to be minimally invasive, so there’s less of a need to provide deep sedation as for extensive procedures. If you’re worried about pain, don’t hesitate to ask your dentist about their expertise in pain reduction and sedation. Advances in dentistry have made procedures quicker and more discrete as well, resulting in less recovery time afterward. You know a bad cosmetic procedure by the fact that you can notice it at all. Good cosmetic work, whether dental or surgical, doesn’t call itself out. Cosmetic dentistry such as teeth whitening looks unnatural if someone goes for too many treatments or has a heavy-handed dentist, but this isn’t indicative of the majority of treatments. A good cosmetic dentist will inform you of when it’s time to stop, give your teeth a break, and enjoy your white smile without going for optimal blinding power. One of the biggest deterrents that prevents people from seeking out cosmetic treatments they would otherwise opt for is the cost. But cosmetic dentistry isn’t necessarily expensive; in fact, your insurance may cover it. It’s certainly worth checking your policy to see if cosmetic procedures are covered. You might as well get what you’re paying for. Cosmetic dentistry is seen as being aggressive to a natural set of teeth, but that is not the case. An experienced, reputable cosmetic dentist can analyze teeth to determine what level of treatment is appropriate to give great results without compromising the foundation. Make sure you disclose your entire dental history before undergoing a treatment. The more your dentist knows about you, the better able they are to make decisions for the well-being of your teeth. Over-the-counter whitening kits will give you some results, but they won’t be as dramatic or lasting as cosmetic dental work. Cosmetic procedures performed by specialist are in a completely different medical category than treatments that can be found at a drugstore. Dentists go through special training because their cosmetic treatments are much more powerful and must be administered much more carefully. An at-home product really can’t compare. In 2018, many people still hold the belief that cosmetic dentistry is something only A-listers do. They think that stunningly white teeth are only for people whose livelihood depends on looking perfect round the clock. Thanks to the incredible growth of the cosmetic dentistry industry, this myth can be firmly put to rest. As with plastic surgery, falling prices and widening acceptance is making cosmetic dentistry completely in the realm of possibility for average folks who simply want to look their best and gain a bit of confidence. Cosmetic dentistry, though increasingly popular year after year, is still the subject of plenty of myths. Some people understandably worry about pain, price, and efficacy, but the good news is that these fears are mainly based on hype and hearsay. Information is the antidote for beliefs that hold no basis in fact. After learning more about the reality behind this segment of dentistry, maybe you’ll consider putting a gleaming white smile on your wishlist. Roots on Whyte sets the standard for biological dentistry, taking a holistic approach to maintaining the health of your smile. From environmentally aware paints and finishes used within the clinic to digital x-ray use, every measure taken is thought of in depth before being implemented as practice. If you’re looking for conscientious dentistry in the Edmonton area, call 888-602-2308, or contact us here.